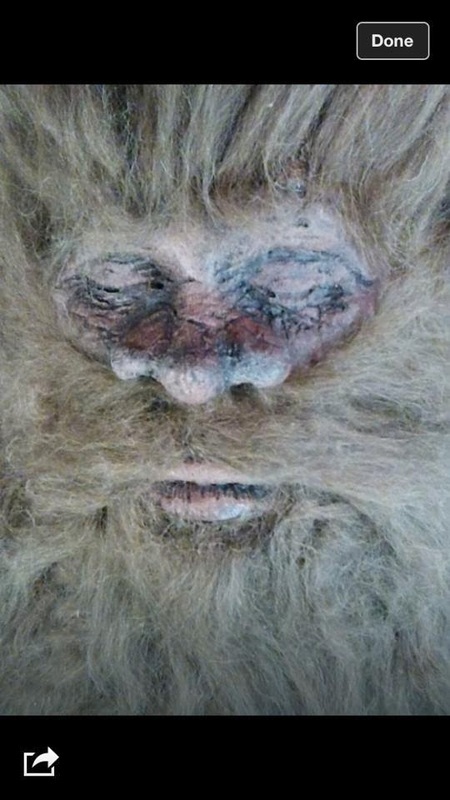 For the past decade, I've done active and passive research on Sasquatch, especially in the Pacific Northwest. Some of the evidence wound up in my books, TALES OF THE CRYPTIDS and IN SEARCH OF SASQUATCH. Others came to my attention after the books had been published. I share some of those stories here, for your consideration! 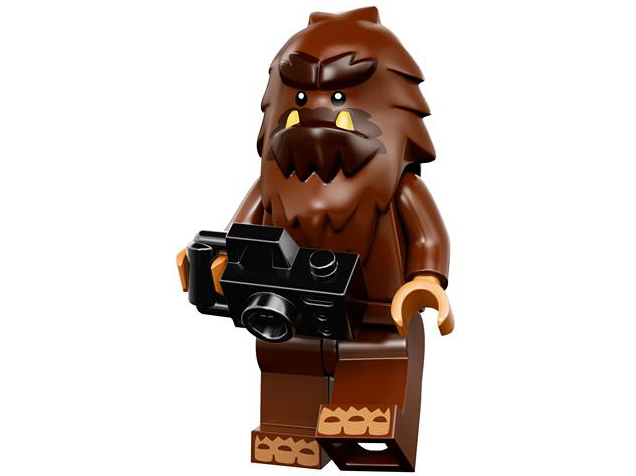 Lego Monsters -- including sasquatch -- are coming! squee!!! Read more about the whole set here! caitlin from khq talks about sasquatch -- with me! 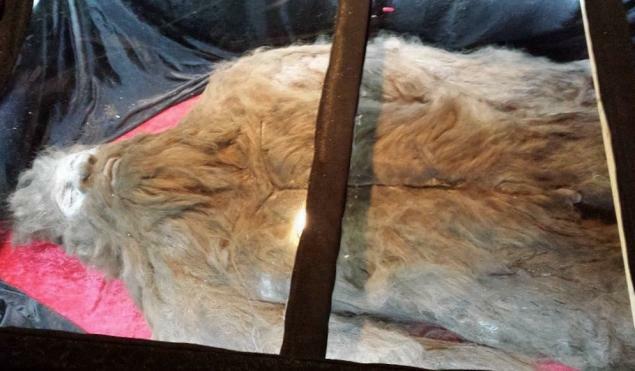 Rick Dyer -- the man in the cowboy hat --claims he shot and killed a Bigfoot near San Antonio, Texas and he is touring the body all over the United States. He says he shot the Bigfoot as a film crew from the BBC were shooting. He claims a team of university scientists studied and autopsied the body. And he says these pictures are proof the animal really exists. It was confirmed as a hoax, but even before it was, I was relatively sure of that outcome. Why? 1. Why haven't we seen the BBC film of Dyer shooting the animals? 2. Why haven't the camera people from the BBC talked about the experience? 3. Why aren't the university scientists talking about their study? 4. Why haven't we seen the autopsy report? I then listened to Dr. Jeffrey Meldrum's comments on Dyer's claims. Then I considered the evidence. That said, if Rick Dyer ever brings his Bigfoot trailer to Spokane, I will pay to see his creature. I will take pictures of my own, and it will be fun. But it will be fun as a hoax, not the real thing. I've written about Sasquatch. I've written about the Loch Ness Monster. I've written about aliens and UFOs. How could I NOT love this shirt from Threadless? Yes, I bought it. I never buy t-shirts, but I couldn't resist this one. LOVE. LOVE. LOVE. Here's a link, in case you want one too. Thanks Ann Downer, for the head's up. This is a press release about Dr. Ketchum's DNA finding, after five years of studying Bigfoot DNA samples. I'll have to read the peer reviewed paper, but if this is true, WOW. She basically says Bigfoot is a cross between early man and an unknown primate likely to have first appeared in North America about 15,000 years ago. She warns that the the population should be legally treated as an indigenous people, fully protected under the constitution and the laws of the United States. I'll let you know what I think after the actual scientific paper is released to the public. But, WOW. DALLAS, Nov. 24–A team of scientists can verify that their 5-year long DNA study, currently under peer-review, confirms the existence of a novel hominin hybrid species, commonly called “Bigfoot” or “Sasquatch,” living in North America. Researchers’ extensive DNA sequencing suggests that the legendary Sasquatch is a human relative that arose approximately 15,000 years ago as a hybrid cross of modern Homo sapiens with an unknown primate species. new video clip and video summary of other clips. Dr. Jane Goodall says yes, she believes in Sasquatch! Kitsap 911 Call -- Bigfoot in the Backyard? Warning -- some swearing from the man who dialed 911. Authenticated as part of my research for IN SEARCH OF SASQUATCH. ...posted these on Facebook minutes ago (February 2. 2012) and I had to share them, too. Thank you, Dr. Meldrum Fascinating. Don Jeffrey Meldrum: A number of years ago, Gordon Strassenburgh organized a symposium on the subject of sasquatch for the annual meetings of the Society for Scientific Exploration (held that year in Kalispel, MT). Three of the presentors were invited to write up their presentations and submit them for publication in the society's journal. I just stumbled on the archive of reprint pdfs from past issues available on-line and thought I would share for those interested. Cryptomundo's terrific writer Craig Woolheater shared this footage on the blog, New Year's Day. It reminded me of how much I love the late Paul Freeman's video, especially this uncut version. Some say it's faked, but I doubt that. Freeman has always seemed credible to me. So I'm sharing the link to Cryptomundo HERE and the YouTube video as well. Enjoy, and Happy New Year! My friend Erik Brooks is a brilliant illustrator and a great human being. Check out his Thanksgiving comic above and his exceptional blog right HERE. I love this, for obvious reasons. Happy holidays to everyone. 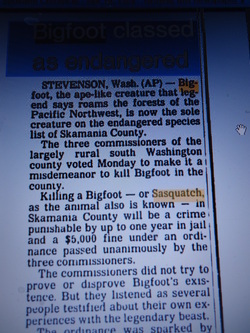 Okay, part of why I posted a link to the Bigfoot Reads blog is because it briefly mentions IN SEARCH OF SASQUATCH. But the main reason is more simple. I love the blog header! Pretty neat, huh? Yup. It is. Bigfoot hat, anyone? Yeti hat, too? Have you been aching for your own Bigfoot ear flap hat? 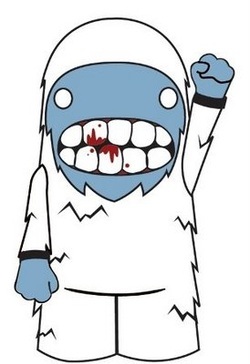 Have you had dreams of wearing a Yeti on your noggin? If you live in Spokane, Washington, your dreams can come true, thanks to the brilliant buyers (pictured to the left) at Boo Radley's Toys & Gifts at 232 N. Howard in downtown Spokane (across from the fountain in Riverfront Park). BTW, that's my daughter, Kerry in the Bigfoot hat (left), and her friend and co-work Jen in the Yeti hat (right). Aren't they just SWELL? In early October of 2011, New York Sasquatch investigator Bruce Barraclough, Jr. joined a Georgia Bigfoot Research and Investigation team in Georgia's Chattahoochee National Forest for a remote investigation. 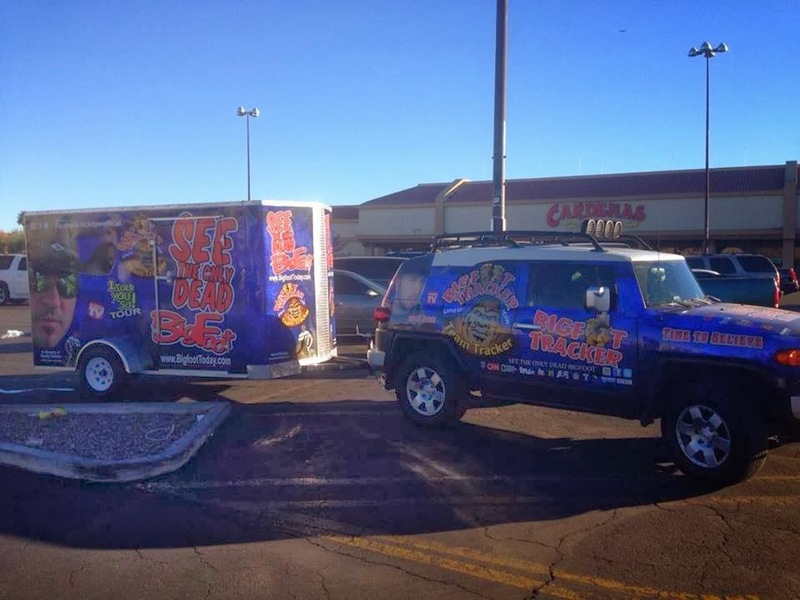 For a complete review of his experience, visit the Bigfoot Field Reporter's blog. It's a detailed write up. Here's a preview: Bruce was walking down a trail with one other investigator when he heard movement behind them -- repeated movement. As a gesture, or perhaps to distract the "visitor" he left his full canteen on the trail and walked on, then radioed his fellow investigators, asking them to pick it up when they walked back to camp. Once they got to the spot on the trail, they found an empty canteen with a turtle shell carefully placed on the container -- a thank you gift? It's hard to tell. As dramatic as that sounds, it's nothing compared to what happened next. Be sure to read the blog. Bruce had an amazing, personal exchange, according to this reporter's story. The image has nothing to do with the post. It's just cute. But this website, put together by the Oregon Bigfoot folks, is a great stop for all kinds of Sasquatch SOUND files. Which one to you find the most convincing? 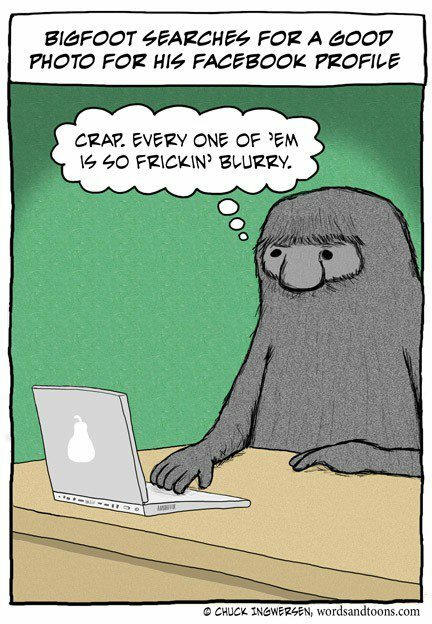 Is this the cutest Bigfoot adaptation EVER? I found it on this terrific website for $65.00. I may just have to buy it for myself for Christmas. Be sure to watch for the flex of her thigh muscles, the length of her arms and the evidence that she is, in fact female -- that's why experts call her Patty.